I just discovered a blog called That Artist Woman. Her site is full of the most wonderful art projects. 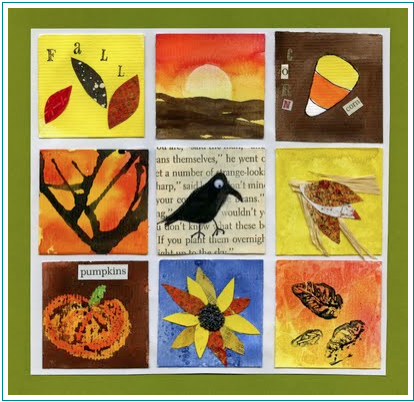 I think this one, called the Fall Inchie project, is so sweet and charming. I would love to do this with my class. 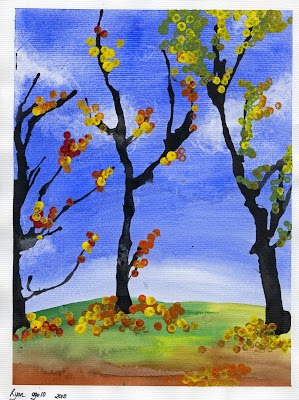 This painting, called Fall Trees, is equally as beautiful. Oh! Those trees would really inspire kiddos! I make calendars with the kids, featuring their artwork, for parents at the holidays. This would make a perfect project for October or November! Thanks for the inspiration. Barbara...thanks for the note! I am following your blog now too! I love the fall trees and am going to hop over to the site and check out those trees. Would love to do something like this with my firsties!